This is the third in a series linked articles on the design of PWM controllers. its maximum operating voltage is limited only by the voltage breakdown and power dissipation in the series pass transistor, Tr1. stray signals injected into the supply line are clamped by the zener. Normally regulator ICs do not clamp their output voltage and if a signal gets get in, the output voltage will rise until something fails. it is intrinsically fail-safe. Almost anything untoward that affects the supply voltage and is powerful enough will overload the clamping zener. Zeners tend to fail short circuit, acting as a crowbar across the supply. We have lost the sense MOSFET, Tr12 of the old circuit. Instead, the Vds(on) of the MOSFET is fed to pin 10 of IC1d where it is compared with a voltage derived from the internal 12v supply. The 'problem' with the old circuit was that it used the Vbe of a transistor so could not sense Vds(on) of less than about 500mV. So the current limit is not very adjustable. The new one uses a comparator which can sense down to effectively zero Vds(on) by altering the reference voltage on pin 11. 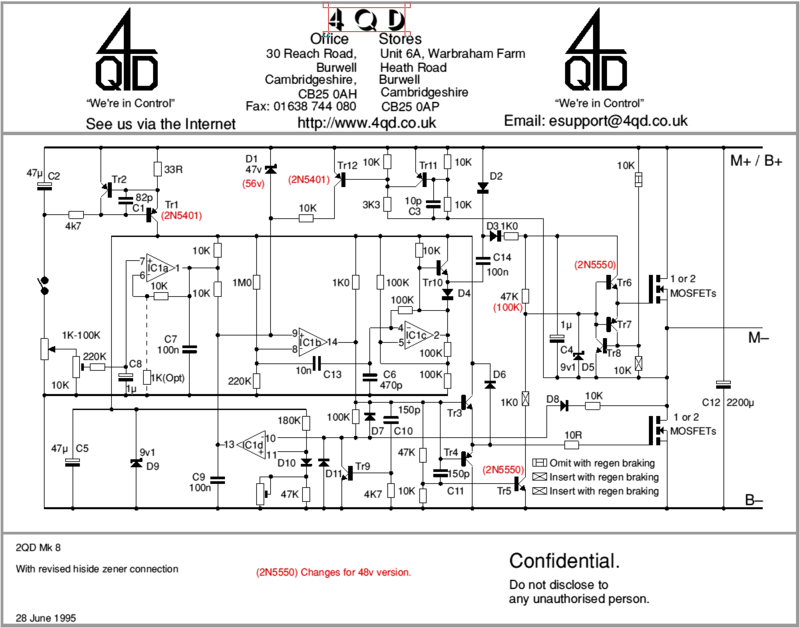 A more detailed desription of the current limit circuitry follows in part 5, where it refers to the newer NCC circuitry. However both systems are essentially the same but whereas the NCC circuit clamps the sensed voltage with a transistor, this circuit switches off the sense divider by driving it from the gate drive waveform. The only disadvantage of this is that some makes of LM339 are extremely sensitive to negative going spikes on their inputs. This is well a known 'feature'.and the reverse biased diode shown from pin 10 to earth is there to clamp such spikes. It is inadequate with some makes of LM339! Note the presence of a diode in the pin 11 reference bias divider. There is a diode in the sensing arm, to the drain of the bottom MOSFET. Including one also in the bottom arm of the bias network means that any temperature effects due to ambient temperature changes will affect not only the sensing arm but also the bias arm, so will cancel out. Notice also the switch across Tr6. If this is closed, the high side MOSFETs can never be turned on and the result is that they act as diodes so there is no regeneration possible. However, although this works, it is not really advised because a diode (such as a MOSFET) drops a far higher voltage when conducting than does an actively turned on MOSFET (which acts as a pure resistor for both directions of current flow). The result is inefficiency in the controller - or, to put it simply, the flywheel MOSFETS get pretty hot so needs good heatsinking. There were only minor variations in these, so the next article deals with issue 7.